The new noma restaurant village, named the world’s best restaurant four times, was recently completed to plans by BIG-Bjarke Ingels Group. BIG-Bjarke Ingels Group has designed a new restaurant concept, a culinary village and garden, for the new noma. Noma, an acronym for the Danish words “nordisk” (Nordic) and “mad” (food), is the famous restaurant run by Danish chef René Redzepi. Opened in Copenhagen in 2004, the restaurant has two Michelin stars and has been named the world’s best restaurant four times in Restaurant magazine’s ranking of The World's 50 Best Restaurants. It won the prize in the years 2010, 2011, 2012, and 2014, placing second in 2013 after the Spanish restaurant El Celler de Can Roca. Noma opened in 2004 in a former ammunition storage facility, built in 1766 and completely renovated and converted into an arts and cultural centre, located on the artificial island of Christianshavn. 14 years later the restaurant moved into the community of Christiania, in a former ammunition storage facility for the Royal Danish Navy surrounded by two lakes. Christiania is an independent community in Copenhagen, a unique social experiment which originated in the ’seventies, a village of colourful buildings where there are no police and no cars. 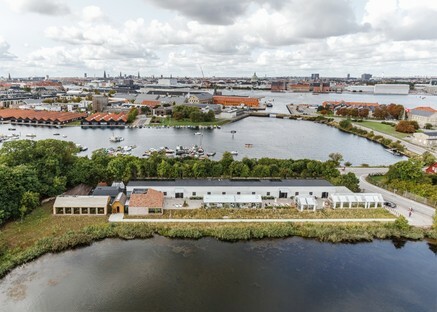 In this unusual neighbourhood in the Danish capital, in a former warehouse between two lakes, the architects of BIG-Bjarke Ingels Group designed a restaurant which is cosy and contained while at the same time making the most of its natural surroundings and the landscape around it. The new restaurant concept is inspired by the idea of breaking down different functions and therefore the spaces required for the life of the restaurant. Eleven spaces are distributed over a collection of separate little buildings linked by walkways. Each building is custom-built for its specific function and made out of the best materials for this function. The kitchen is located in the middle of the layout, as the heart of the project, and from this central position the chefs control the restaurant’s various spaces and functions: the entrance, the lounge, the barbeque, the wine cellar, etc. At the same time, the new concept reveals to the public what normally happens “behind the scenes” in a restaurant, thanks to covered glass walkways connecting the different buildings. Seen from the outside, the restaurant has three glassed-in volumes, three greenhouses used as a restaurant, an experimental kitchen and a bakery. The set-up of the wooden interior, with big glass surfaces, both windows and skylights, in the rooms and corridors, ensure that guests always maintain a direct relationship with their natural surroundings. Changes in the seasons, for example, become an experience to be lived, not only with new colours in the landscape and new crops in the vegetable plot, but through the culinary experience itself, in a continuous dialogue between inside and outside, between the architecture and what it contains.